SUPPORT THE SUMMER CONCERTS COMEDY NIGHT - May 10, 2019 - OBP : CHAMBER : Positively Oberlin! Doors open at 6:45 p.m. Show starts at 7:30 p.m. Enjoy an evening of laughs with friends and colleagues while helping to raise funds to keep the FREE Summer Concerts on Tappan Square for another year. The cost to bring entertainers to our small town has increased in recent years. The Lagrange Firefighters said this when they cancelled their concert for this year, "The cost of entertainers has made it nearly impossible to keep ticket prices reasonable." We want to be able to continue to offer FREE concerts in Oberlin - we need your help. 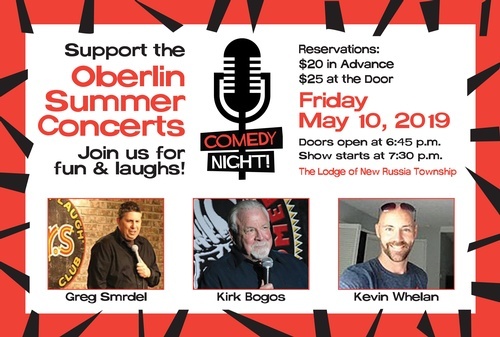 So, we hope you will come to the Comedy Night to have fun and laugh...but also to help us raise funds to keep the Oberlin Summer Concerts a tradition in our Big Minded Small Town! The evening includes finger foods: snacks to nosh on, desserts, and a cash bar with Beer, Wine, and Soft Drinks. Three comedians - an Opener, a Feature, and a Headliner - will entertain and provide Friday night stress relief. Try your luck at the 50/50 raffle and the Prize Raffle. Save $10 - invite your friends and reserve a table for 8 for $150! Event closes at 10 p.m.
A Table of 8 is $150.